In Part 1 of this series, we looked at a brief description of in-memory tables, the syntax for creation, and benchmarked data insertion and update. Part 2 will continue with a concentration on the SELECT statement for benchmarking, and also touch on in-memory stored procedures. I had several dialogues with Bob Ward at Microsoft® about the lackluster in-memory performance on this query. Following experimentation, Bob said that the compiler didn’t optimize in-memory table scans, and that performance should be compatible with a disk-based table. In the case of the in-memory table with a ColumnStore index, performance was significantly improved (62X, but with the baggage (extra RAM) of the ColumnStore index). So, let’s now look at a few cases where the result set is only a few rows for a SELECT query. In-memory tables have roughly the same performance as disk-based tables (no physical reads in this example). Notice that the in-memory tables access a non-clustered index without covering columns. This is because covering columns are not needed for in-memory indexes; the index points to the actual memory address of the row, hence all columns are immediately accessible! I tried using extended events to capture CPU, which you can do in microseconds, but capture was not always consistent. Even with a SELECT* we still have non-clustered indexes with no covering columns for the in-memory tables. Interestingly, for the disk-based table, even though there were 8938 rows returned, the optimizer still selected a key lookup, of course 8938/4973997 = 0.18%, which is well below the predictive criteria for switching to a clustered index scan. Query 3 also asked for a missing index, which essentially was a covering index for the entire table. The ColumnStore index is starting to have an effect on the result. Query 1 uses an Index Seek, while Query 2 uses the ColumnStore clustered index scan. The disk-based Query 3 is forced to do a Clustered Index scan because all columns are being returned (SELECT *). Now let’s look at creating an equivalent in-memory table to Sales.SalesOrderHeader and using it with joins to the three benchmark tables. Oops! Once again, a table scan causes issues with an in-memory table. In Query 2, the optimizer takes advantage of the ColumnStore index. 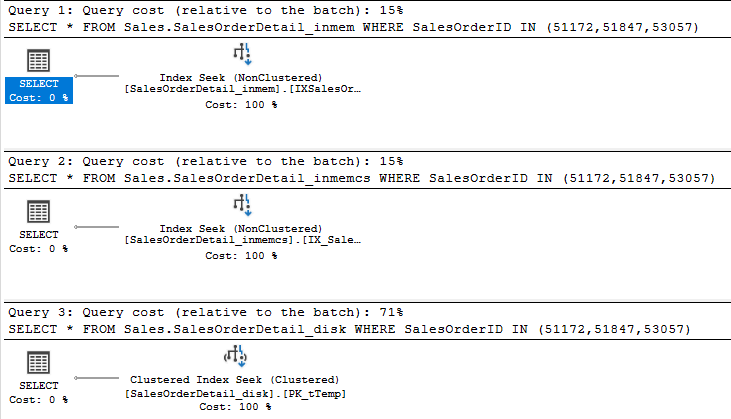 In Query 3 (disk-based), the optimizer took advantage of a non-clustered index for the count on SalesOrderDetailID. This is not the result I expected. Normally I use this for any in-memory stored procedure where there is a DML operation. I also usually add code to log any concurrency issues found so that I can investigate after the fact that there may be an issue to look at. To continue our benchmarking, let’s create the additional two stored procedures. Concurrency error checking is not required because no DML operations are being performed. inmem:	CPU time = 141 ms, elapsed time = 370 ms. The results are interesting. The original Query 1 shows a significant performance improvement over the TSQL code syntax, but the ColumnStore (Query 2) still wins. This does suggest that Microsoft® does do a fair amount of query optimization in their stored procedure compiler. Also, note that there was no execution plan for the in-memory sprocs. Did Microsoft meet their design goals? Okay, now what can I do with in-memory tables? So, do the pros outweigh the cons? I think so, and I’m just itching to find a customer that will allow me to implement them.